If the Alvin Ailey dance troupe gets any better it may have to be designated a National Historic Landmark. As things stand, the Ailey is financially solvent (almost unheard of for an arts organization in these times), about to move into spiffy new $58 million Manhattan digs, and playing to sellout crowds wherever it goes. This week&#146;s venue is Berkeley, for what has become an annual love-fest sponsored by Cal Performances. Somewhere up in Dance Heaven the founder must be smiling and, perhaps, executing a quick time step. 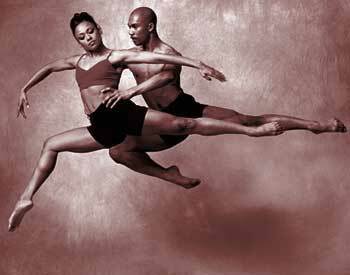 Ailey protege Judith Jamison has done the company proud since taking the helm upon Ailey&#146;s death. Although some of us may remember her as the high-stepping lady with the umbrella wadin&#146; in the water in the company&#146;s signature piece "Revelations," she is now known as an artistic director of the first order. That she was a dancer first is evident in the artistic sensibilities of the repertoire. First up on opening night was Alonzo King&#146;s Heart Song. King choreographs for his own San Francisco-resident Lines Ballet as well as other companies around the world. He made Heart Song on the Ailey company last year. Like many of his works for his own troupe, this is a highly ethnic, somewhat ritualistic piece, done to voice, drums and a wailing violin that gave it a somewhat middle-eastern feel. The Ailey dancers exhibited amazing strength and technique in the piece. The only flaw may be that it was a tad too long. Elisa Monte&#146;s Treading, a familiar piece in the Ailey repertoire, is a perfect marriage of music and movement with the dancers seeming like sea creatures in a dimly lit viscous element. The steps are as minimal and precise as Steve Reich&#146;s Music for Eighteen Musicians to which they are set and Linda-Denise Fisher-Harrell and Clifton Brown did them proud. Robert Battle&#146;s 2003 Juba is a thing of foot stomping and fist beating, to a score by John Mackey that is heavy on drumming. Hope Boykin, Matthew Rushing, Samuel Deshauteurs and Abdur-Rahim Jackson begin by joining hands and moving, first together, then separately, to the non-stop score until all fall down in a heap. The second section is jazzy as the dancers work themselves into a frenzy. The piece ends as it began, with the quartet of dancers moving ritualistically &#150; only harder. Whether this is a celebration of joy, as has been speculated elsewhere, or something else is not clear. Doesn&#146;t matter. It&#146;s wonderful to watch. What&#146;s to add to everything that has been written &#150; here and elsewhere &#150; about Revelations, Ailey&#146;s big 1960 celebration of the African-American spiritual? Perhaps only that one envies the people who are seeing this perennial favorite for the very first time. And impressions: Fisher-Harrell&#146;s amazing line in "Fix Me, Jesus;" Glenn A. Sims seeming not to have a bone in his body in "Didn&#146;t my Lord Deliver Daniel;" the sheer kinetic energy of Brown, Deshauteurs and Jamar Roberts in "Sinner Man" and those fan-fluttering church ladies in their big hats in "Rocka My Soul in the Bosom of Abraham." As many times as you may see this piece, it always seems fresh and exciting and, even with that traditional finale encore that sets the audience to soul-clapping for all they&#146;re worth, it always ends too soon.